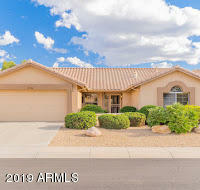 All EAGLE RIDGE PHASE 1 AT WE homes currently listed for sale in Peoria as of 04/23/2019 are shown below. You can change the search criteria at any time by pressing the 'Change Search' button below. "Perfect location in age restricted Westbrook Village in the coveted Eagle Ridge subdivision on a wide, clean & quiet street. Pool home with the perfect sized backyard for low maintenance. Tiled Arizona room, 3 bedroom, 2 bath, and over 1800 sq. ft., not including the Arizona room. Move-in ready or ready to add your own touches. Close to great shopping and restaurants near Bell Rd and P83. Priced low at only $164/sq.ft. This one will go quickly, so hurry and make an offer. Westbrook has 2 big com"